Situated close to the Equator the giant Huvadhoo Atoll is one of the largest true coral atolls in the world, yet it remains little explored inland by independent backpackers. That may be set to change, Donna Richardson discovered as she stepped ashore previously unexplored emerald islands of the ‘Middle Maldives’ during a cargo ship journey from Male’ to Addu via Huvadhoo. Unspoilt and pristine, Huvadhoo atoll is split into two administrative districts: Gaaf Alif in the North and Gaaf Dhaal in the south. Historically it has been difficult to access these islands, and it is certainly off the beaten path, unless you charter a cargo shop or similar trade vessel. Many islanders have been travelling this way for years to visit relatives in their home islands. This is exactly how I joined my vessel, paying a very small fee for my passage. 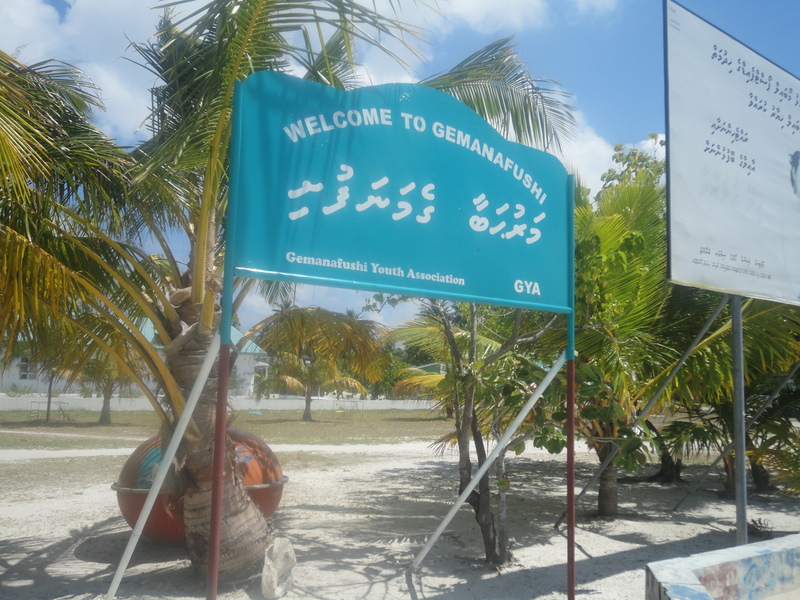 Huvadhoo’s remoteness is also its ‘indie’ market’ appeal. Enquire on cargo ships going to Addu at Male’ Fruit and Veg market and you could find yourself able to visit two or three local islands and set foot ashore for an hour or two while the crew offloads supplies. Given its sheer distance from Male (around a day and a half’s journey by basic boat) Huvadhoo has been sheltered from the outside world until recently. Now the new government is focusing on opening up independent travel routes to make it easier for explorers to navigate these shores. Commercial backpacker tourism hasn’t arrived yet, but if you know the right people it is more than possible to get to one of the larger islands and from there hire a small dhoni to take you island hopping around the islands and sandbanks to experience your own slice of Paradise. It is most certainly the right time for any one who likes to take the road less travelled to visit, before the big boys move in to develop the region as a luxury to mid-market tourist destination. Overall development here is set to be huge over the next decade, especially as the government opens up its independent travel network. Huvadhoo already has three regional airports serving the big-name resorts such as the Park Hyatt, Robinson Club and J-Resort Raalhuveli – as well as Per Aquum’s Soul Salus Fushi. To reach Huvadhoo from Male the cargo ship must first pass through Laamu, home to the recently opened Six Senses Laamu resort, and a 90 km wide stretch of water called the Huvadhoo Kandu or ‘One and a Half Degree Channel’ Due to its latitude this channel is one of the safest places for ships to pass between the atolls that make up the Maldives. In the south the barrier reef is exposed to another stretch of water, known as the Equatorial channel, which separates Huvadhoo from Seenu Atoll, more commonly known as Addu. Liveaboard safari boats have long been taking divers to this region which is rich in soft corals. Meanwhile surfers flock to catch the waves on remote breaks in Gaaf Dhaal aboard ‘Surfari’ boats – safari boats decked out with surfers in mind. 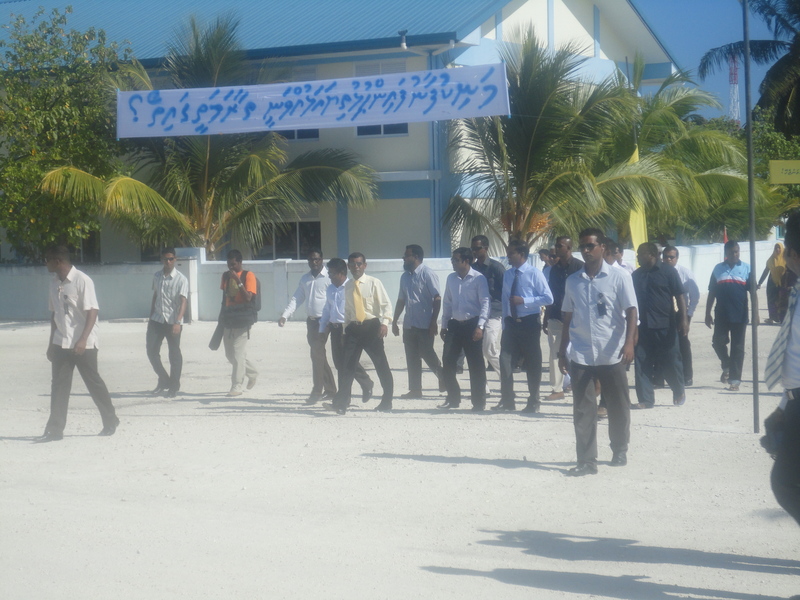 The capital of the southern atoll Gaaf Dhaal is Thinadhoo. While I didn’t step foot on this historical island, I heard much about it from about it from fellow passengers. It is infamous as the home to an uprising for independence from Male’ when the region declared itself the United Suadivian Republic for a short time before Male sent in a troop to defeat the dissidents. Due to this, there remains some friction between the capital and the south islands even today. 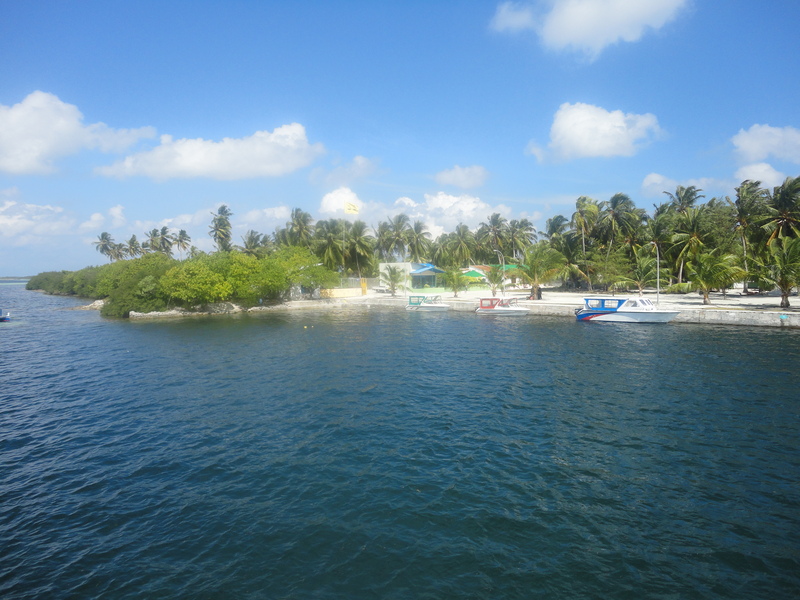 Amazingly many islands which make up the Huvadhoo atoll have never had a tourist set foot on them. Instead they prefer to follow a traditional way of life. Travel is limited to independent travel routes such as a cargo ship or a safari boat but once you get the chance to explore it is more than worth it. So vast are these islands that at low tide it is possible to walk across the reefs and explore 90-0dd islands by foot, as a dare-devil group proved in 2008. As a cargo passenger on a ship making numerous port drops, I was fortunate enough to set foot on some of the little visited local islands, and in between enjoy spectacular views of the horizon on the open ocean. During the journey I spoke to felow passengers native to Huvadhoo who told me about their home islands. Here is my account of the journey. A stunning pink dawn sky broke above Dhaandhoo an island in Gaaf Alif which was in the midst of a presidential visit. As we moored next to the pristine presidential yacht, I noticed all the other vessels – save the yacht and Maldivian National Defence Force boats which flanked it- were simple dhonis and fishing vessels. 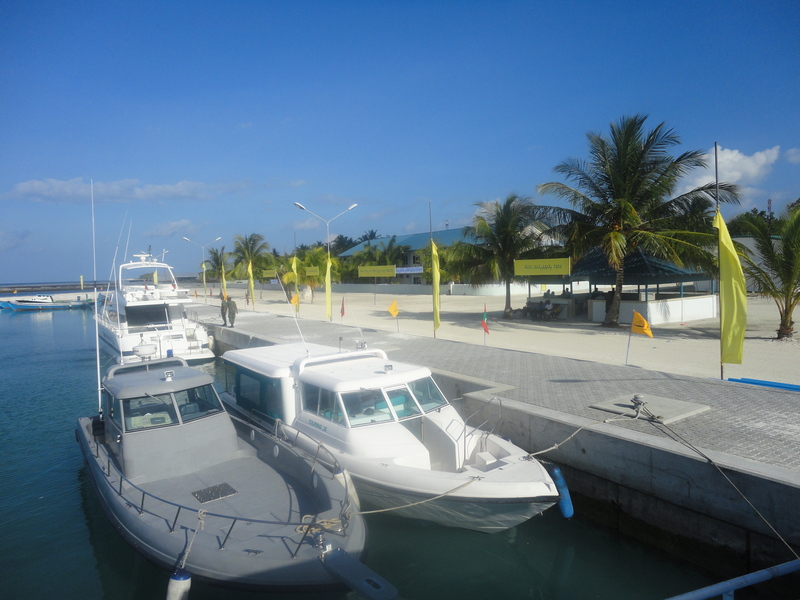 The harbour itself was lined with yellow banners welcoming President Nasheed to the island. Dhaandhoo is fringed by a small man-made harbour built out of coral rocks. In the absence of a proper jetty we had to pull up a plank against the bank and walk ‘pirate style’ onto the island. As the crew unloaded supplies I hopped off the boat and ventured east towards the rising sun. 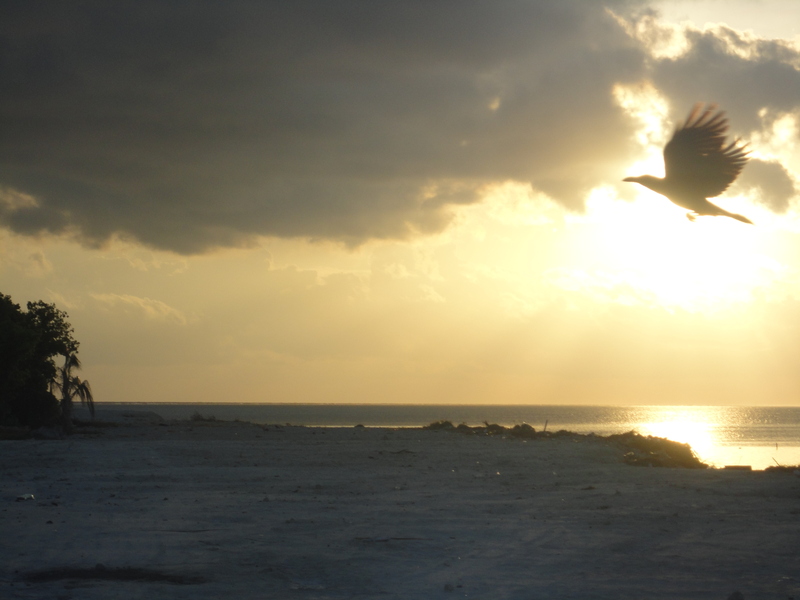 As the sun rose from the sea among dark clouds, a wild bird flew across the dramatic reclaimed beach – a dramatic effect which I pause to capture on film. Passing barren beaches populated by crows and herons I observed local life and nature going about its business. the sea front in this island which is in desperate need of housing. Small dhonis lap in the waves and in the distance is an uninhabited picnic island and as I peeked into the interior I glimpsed a curious mix of coral houses and shacks amidst the jutting palm trees. It is clear that this island is quite poor in comparison with its neighbours. Women rise early to collect rain and sea water to boil so they can wash and cook during the day. Their men prepare for their days work on the fishing boats. Evidence of reclamation is evident and projects have begun along the island edges, creating more land to the west of the island including an artificial beach. 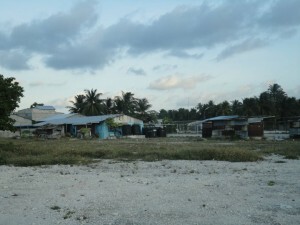 Islanders say more is needed to build flats and houses for their children so they don’t have to move to Male’. There is a small school and a playground but not many activities for youngsters to do. It is almost perfect. 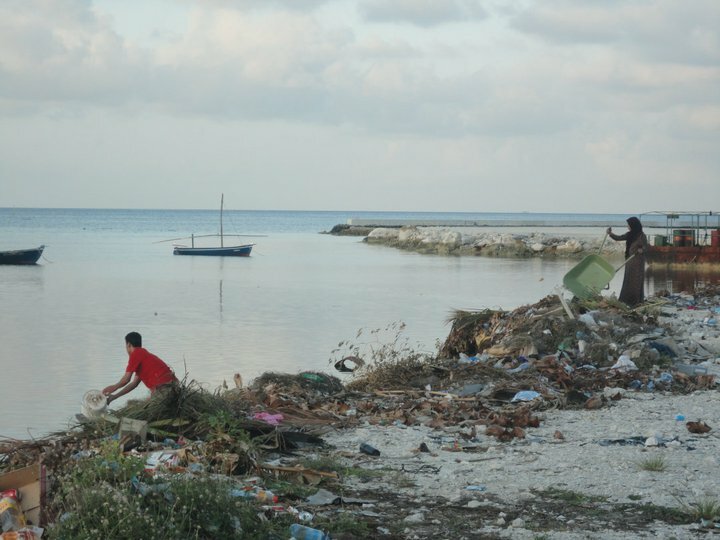 Except one thing – unfortunately locals here have not realised the damage of littering. A little old woman with a wheelbarrow nonchalantly drops a pile of rubbish into the sea. I continue past a building site and dredging site, passing a beautiful grey Siamese looking cat with piercing green eyes that lazily winked in contentment perhaps he had just caught a big fish from the lagoon for his breakfast. With little to do on the island, politics are high on the agenda. Democracy is young and for many just a notion that has yet to filter down from the capital to the islands. Many disaffected islanders still support the DRP party which formerly led by Maumoon Gayoom who ruled in a dictatorship for over 30 years. Nonetheless the people of this overcrowded small-circular island, the third largest in the atoll, are warm and friendly, if a bit animated due to their new found democratic right to freedom of expression. News travels fast on small islands and hearing there was a journalist on the island, I attracted some interest too. The island is traditionally an MDP stronghold but the DRP candidate Zadhy Ibraham pulled up on a moped to give me his party line. Hostile to the president’s presence he told me that the island had run out of funds to pay for its reclamation projects, blaming the present administration for its problems. “We need more jobs and more employment prospects for our young people,” he said. “Right now we have 60 children about to leave school and almost all will go and seek employment in Male. The government needs to do more for us so we don’t lose our young people.” he said. I point out that it will take some time for democracy to spread to the islands and undo 30 years of damage caused by the dictatorship which reigned for over 30 years. Islanders lead a simple way of life. Namely they are reliant on fishing income. Their chief concern is to reclaim enough land to build homes for their burgeoning population of 2,000 people. Some of the urgent needs for the island include development of housing, schools, a jetty and new business opportunities to stop the transito their young people to Male’. Now they had a chance to voice their needs personally to the president. My walk and observations around the island took about 2o minutes. As I arrived back at my departure point the sun’s rays shone on the handsome presidential yacht enveloping it in a golden halo. A hive of activity began to surround it as curious islanders waited anxiously to glimpse the president and his entourage making their way back to the boat. At this time it was local elections so the President’s Maldivian Democratic Party (MDP) was canvassing votes ahead of the polls. Giving a keynote speech on the island the previous evening, President Nasheed had decided to stay at the home of the local Kateeb (island chief) the night before. Sadly I didn’t manage to speak personally to the president as our cargo boat had a schedule to keep. However, we did tail-gate the Presidential yacht as it set sail, although their ‘Formula One’ standard crafts were much more powerful than our oversized dhoni and outpaced us all the way as we set sail for our next port drop of Germanafushi. During the short journey to Germanafushi, just a few islands away, we ate lunch and arrived just as we cleared our plates. As we left the choppy deep blue sea and navigated the azure lagoon that shone in the bright sunshine the characteristics of the islands emerged. Lush foliage, wide sandy roads and cute coral cottages gave a feeling almost like when you arrive at a resort, despite being home to around 1,800 people. There was a welcoming committee too, islanders waiting for their supplies. Luck smiles down on me as I happen to meet another journalist Mohammed Nasih who works for MNBC news channel. Spending his vacation here, he is waiting to collect supplies for his grandmother’s shop from the ship but kindly offers to show me around the island. I gladly accept, glad to have guide who speaks the local lingo. Fishing is the main income of the island, yet there are only three fishing vessels. Everyone can not be a fisherman, so the rest of the population is unemployed. With limited agriculture and infrastructure there’s a few key jobs in the public sector for teachers and doctors and island councillors. There is a small school, a satellite hospital and Island Council Office. Generally islanders are all friendly and sociable but I could sense a feeling of discontent amongst them, which turned out to be political. Despite virtually neglecting the islands for 30 years, allegiance to the Gayoom and the DRP party is still strong -I believe it is more a case of “Better the devil you know.” Being a DRP stronghold the islanders blamed all their problems on the current administration. Spotting a group of men lounging on undolis, I asked Nasih to introduce me and was surprised to find they were not unemployed layabouts rather teachers and politicians. With both school and parliament in recess they spend their time sipping tea in the shade while discussing politics. I listen to their complaints. First on the agenda was harbour building. They say that under the Gayoom administration funding was allocated for a 700 ft harbour to make it easier for boats to pass but the plan was withdrawn by the new adminstation because harbours must measure at least 1000 ft.
Asim Mohammed and Samir Ahmed, both teachers at Germanafushi School, tell me there are limited options after leaving school. Many choose to work in Male or on the resorts and sometimes some of the brightest win scholarships to go on to University sponsored by Villa College or similar institutions. Few can afford to continue their education beyond Grade 10. Being the second island I had visited that complained of being neglected, I asked the gentlemen to take me on a tour around the island to see for myself if their fears were founded. First we visited the school which educates around 400 students. The principal of the school Aslam Hussein told me the school needed to access more funding to build more classrooms, a science lab and computer room. It also needed books and resources to help extend the curriculum so that islanders could receive a better standard of education up to at least Grade 12. He told me that the children are taught the local Maldivian curriculum up until grade seven and then they follow theUniversityofCambridgecurriculum. Academically there have been some high achievers in English with one student gaining a grade A in English back in 2008. Furthermore the school was focusing on developing the next generation of athletes with the help of National Development programmes funded by Non Government Organisations (NGOs) are focusing on sporting development. I’m drawn to a globe in the playground and ask what is symbolises. I’m told it was made by the school’s geography department and was predominantly used for island council calls. Before the electronic election system came into place, island officials used to strike the globe six times to call the community together. Furthermore, most people are not insured for medical care and even if they are insured, there is not enough medicine available in the pharmacy.” Those who can afford it prefer to travel to Male or pay high costs to travel toIndiafor treatment of serious illnesses. We took a slow walk back to the ship, stopping briefly for a can of lemonade at Nasih’s grandmother’s house. It wa my first time in a Maldivian house and I sat in a traditional undoli as I gazed around at the family photographs. We chatted and after a while I made my way back to the ship, thanking Nasih for everything. Neighbouring Kaduhulhudhoo (roughly translated in Dhivehi as the bones at the tongue of the sea) is flanked by two uninhabited picnic islands. On approach it appears that the island is the jewel in the crown amongst its neighbours. It is a small island and circled by a lagoon and an excellent house reef. Like many of these islands, its prime income is fishing. There are no cars on this island and most islanders live in coral cottages handed down through generations. Life revolves around the local mosque and politics. Fellow passenger Nashfa, 16, explained that few of the elders speak English, since until three years ago children were taught in the Dhivehi language. Growing up in Male, Nashfa was fortunate to receive a good standard of education until the age of six, but when her parents split up, she moved to the Kaduhulhudhoo with her father. Education is important for Nashfa as she comes from a family of teachers. In her spare time she reads books and newspapers from the internet so she can improve her English. She is now in her final year of study and plans to return to Male’ to enrol on a business and commerce course at the University. For Nashfa marriage is not a priority. Seeing her own parents divorce as a young child because of marrying too early she doesn’t want to repeat their mistake. During school holidays she dutifully splits her time between Male where her mother works and lives and Kaduhulhudhoo, where she lives with her father. Her home island is perhaps the most beautiful out of all those which we have visited so far. It appears to have far more lush vegetation and traditional coral cottages than the other islands. 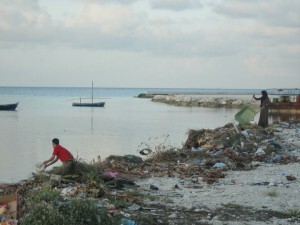 The lagoon is pristine and the harbour is lined by yellow flags signalling this is a pro-MDP island. I stand on the top deck as Nashfa meets her family. People are milling around in excitement as their supplies are unloaded. I note a traditional lighthouse to the far right hand side of the island. Venturing off the boat, I visit a small local shop nestled within a concave bay on the right of the island. The island appears more traditional and has little evidence of construction. I marvel in its natural beauty as I dangle my feet off the bay. Looking out to sea, I can see endless horizon beyond the lagoon. In he distance is uninhabited picnic island and a few traditional dhoni’s which juxta-posed paint a perfect picture postcard scene. Splashing lagoon water onto my chargrilled-skin, I watch the children snorkelling in the sea. I long to join them but my ship is about to leave, so I resist the temptation. 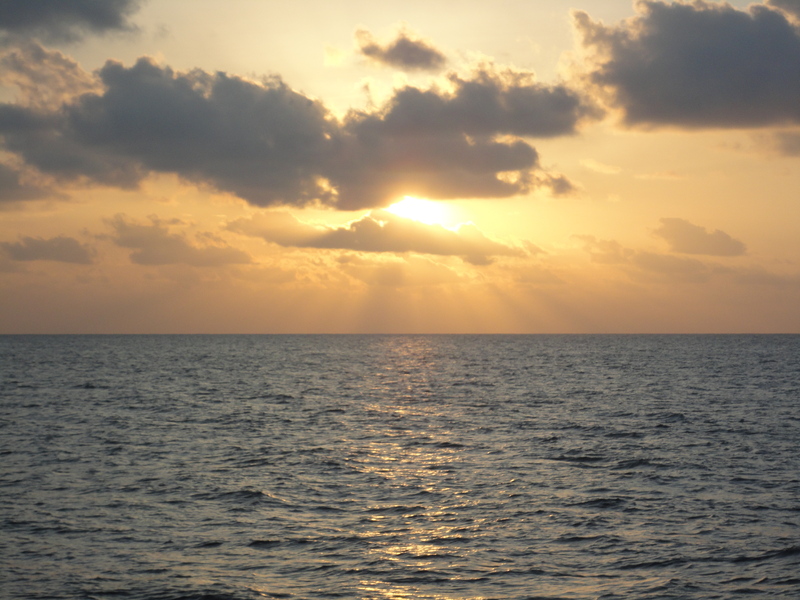 Just 30 minutes later we are back on the open sea, preparing to cross the Equator. We plan to celebrate by catching fresh tuna for our supper. I’ve never tried fishing so I join the Bangladeshi chefs with their long line rods and and learn for the first time. It wasn’t like any angling I have seen before. Firstly there were no rods as such, just four lines attached to wooden cogs that were strewn from the back of the boat. The ship’s chef Ekbal explained how they needed to catch the ‘right amount’ of fresh fish every day to feed the crew as the ship had no refrigeration. As the sun set, we leave Huvadhoo behind and prepare to cross the Equatorial channel, beyond which lies our destination of Addu.